Comic Book ‘Alien At Large’ Just Got Optioned to Be A Film!!! 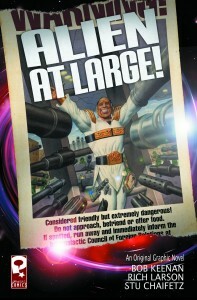 Platinum Studios and Practical Pictures have teamed up to bring us ‘Alien At Large’. This is a graphic novel by Bob Keenan. I don’t know much about this book, but from the description, it looks to play more towards kids than adults. The synopsis reads “Alien Ambassador Boxavo Tan means well, but he’s dumb as a post. He has an uncanny ability to turn every situation into a catastrophe. Once he’s set on a course of action, the only thing his handlers can do is clean up his mess.” So I can see some pretty good comedic actors playing this role. Jim Carrey comes to mind immediately. This entry was posted on Thursday, June 2nd, 2011 at 7:32 am	and is filed under Comics, Film, News. You can follow any responses to this entry through the RSS 2.0 feed. You can skip to the end and leave a response. Pinging is currently not allowed. « Martin Scorsese’s Next Film To Be About Richard Burton and Elizabeth Taylor’s Love Affair? ?